My dad, Stephen R. MacKinnon, is a professor of modern Chinese history at Arizona State University. This is why I lived in China as a child from 1979-81. At that time he was teaching, doing historical research, and working on a book with my mother. He has also written about China coverage by American journalists in the 1930's and 40's. Dad's main focus of late has been on the Sino-Japanese war, as well as the Chinese press in the 20s, 30s, and 40s, before the Communists took power in 1949. 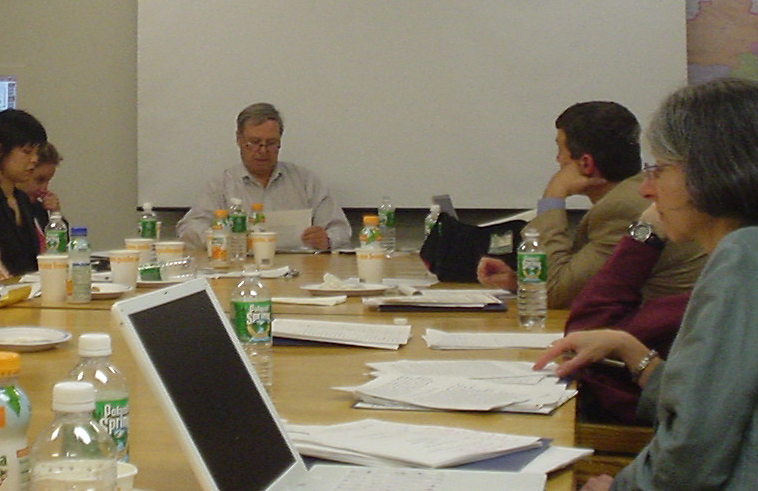 This weekend he is at Harvard for a historical workshop about newspapers in China from 1911-1949. "Cheng was arrested over ten times in the mid-1920's, so often that he hired a person who resembled him to sit near the front door of his office and act as decoy managing editor, thus giving Cheng time, when the police came, to flee out the back door." Later, in the 1930's, when Cheng was running the Shanghai-based newspaper Li Bao (立報, which later moved to Taiwan), he dealt with censorship by leaving a blank space where the article should have been, underneath the original provocative headline. In the very long run, yes. In the short run, the situation is much more complicated. Kristof must actually realize this, not only because he has spent a lot of time reporting from China. Check out this op-ed he wrote about rising Chinese nationalism, especially on the internet. The point is, democracy isn’t the only thing that can sprout and grow on the internet. So can intolerance, xenophobia and belligerence. Don't assume that the expansion of freedom of speech in Chinese cyberspace will necessarily strengthen international peace and brotherly love between China and other countries - the opposite is also possible. Recent anti-Japanese protests certainly make that clear. The fact that Chinese cyberspace was cheering right after the 9/11 attacks (as Kristof himself reported) is another stark example. Don't expect the Chinese blogosphere to bring down the Chinese Communist Party any time soon. In that same rant I explained why. The reasons include the fact that China has the world’s most sophisticated filtering, monitoring, and censorship regime. This filtering enables the Chinese authorities to skew Chinese internet users’ view of the world, encouraging rabid anti-foreign nationalism, which makes people inclined to rally behind the flag and Party, overlooking its massive human rights shortcomings in the face of perceived foreign outrages, which get a lot more bandwith in the Chinese part of cyberspace. But don’t take a lone blogger’s word for it. I just came back from a 2–day conference on the Internet in China. What did I learn? Sure, I learned how the internet and blogs are expanding the possibilities for citizen discourse and even dissent. But I also learned how the Chinese government is aggressively seeking – and finding – ways to use the internet to boost not only its control over far-flung provinces. It's also using the internet to boost its public credibility by creating low-risk cyber-interactivity (as opposed to physical interaction) with "the masses," thus giving people the feeling that the government is more responsive to their concerns - whether or not it really is. The Chinese Communist Party will use everything in its own considerable cyber-arsenal to keep itself alive. Will it ultimately succeed? Probably not in the long run. But in the short run, yes. My next post will be a more detailed summary of what I learned at the conference, which should help explain why the internet isn't going to foster another Chinese revolution overnight. 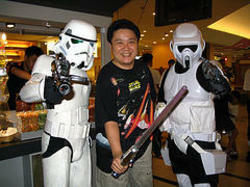 Mr. Brown in Singapore wins the prize for the most original blogger Star Wars viewing photos. Check out the discussion of parallels between Star Wars and the Iraq situation at Raed in the Middle. Bingfeng teahouse sees Chinese parallels. Mack at BrandMalaysia likes this parody better. All of this and more can be found through the Globalvoices Bloglines Aggregator. I'm tracking posts about Star Wars written by bloggers around the world with the starwars+globalvoices del.icio.us tag. If you find more Star Wars related posts from international blogs, please contribute to the list by tagging them with BOTH "starwars" and "globalvoices". When we die, what would you rather have on your tombstone: "He was a great blogger" or "He was a great person"? When you're ninety-plus and bed-ridden looking back at your life would you rather say: "dang, I've had an interesting life" or "dang, I had a great blog!" Maybe if we're lucky we can "have it all," but I for one know where my priorities lie. Joi Ito is worried he's lost his blogging edge, or is becoming boring, that he receives a lot of criticism about his blog, and that he wrestles with blog-block. He asked his readers how to deal with this, and got a lot of advice and reaction. I just posted my own comment on the long discussion thread which has largely become about whether he should care what anybody else thinks about his blog. The general consensus is that he shouldn't. As I said to Joi: "Unfortunately, the annoying people out there are not very forgiving or empathetic about the fact that you are a human being - or that any blogger other than themselves is a human being with feelings. Ignore them." But like David Weinberger I also agree that the shift in his blog probably reflects a shift in his life. Another reason is that if you're going to spend time out there learning new stuff, meeting new people, and having new experiences (plus train for a marathon, get enough sleep, and have a social life), you're not going to have as much time to blog as you would otherwise. It's a tradeoff. If you ask me to choose between having an interesting blog and an interesting life, there's no contest. If I get less traffic as a result and never become an A-lister or become able to make Blogads money, so be it. Plus, lately I've been spending a lot of time on the Global Voices project, some of which involves blogging on the GV blog, but also involves working on the aggregator and networking with people both electronically and in person. That's a priority for me. As I said to Joi, not all good bloggers are good people, and I think he's a good person. That's way more important. At the end of the day, I'll follow his blog no matter what he writes - or how often - because I like and admire him. And I'm thankful that he exists because otherwise my life might be very different. Congressman Chris Cox is trying to mobilize efforts this year to pass the Global Internet Freedom Act. Click the link below for the latest version of the full text, since the link above doesn't always seem to work. "Sadly, No!" on Monday's "Cyberspace riots"
For mature eyes only... Sadly No! reports: Newsweek Retraction Sparks Riots in Cyberspace. 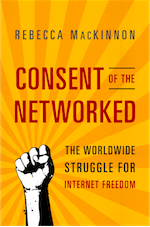 At 12:30pm EST today, catch a live webcast from the Berkman Center. Jake Shapiro of the Public Radio Exchange will talk about the future of public radio in the age of podcasting, which enables anybody to create their own public radio online. Harvard's Nieman Foundation has canceled plans to sponsor a week long training session for Chinese officials who will be handling media for the Beijing 2008 Olympics. The cancellation came after several Nieman alumni raised concerns that: 1) training officials in what is essentially p.r. goes beyond the Nieman mandate (mainly a program for accomplished mid-career journalists who are selected to spend a year at Harvard, taking classes, receiving training, and reflecting on their craft); and 2) the Chinese government is no big friend of free speech, and thus there were concerns that the Nieman training would help them refine their lying techniques. For articles on the whole hoopla, see the New York Times, a Boston Globe Op-Ed and news article, and a Washington Post article. "We want the I.O.C. to seek written assurances that if Beijing is selected, the international media covering the Games will have unrestricted access to the country and that there will be no discrimination against journalists or participants based on their political or religious views or country of origin." To my knowledge, the I.O.C. (International Olympic Committee) has not gotten such written assurances. So what was the point of the planned Nieman training? Well, as it so happens, I was asked to help plan and participate in the training. Why was I interested in doing this? I spent 9 years being on the receiving end of official Chinese lies. Not only that, I spent many hours in police detention, was subject to surveillance, had my videotapes confiscated and had satellite transmission signals blocked when we were trying to report things the Chinese government didn't want the world to see. I have no interest in teaching them how to lie better. While I can't speak for the other organizers, I certainly intended to use my presence at the training as an opportunity to tell these people that lying doesn't pay off in the long run, and makes them look like thugs in the short run anyway. I felt that it was worthwhile to at least try to convince Chinese officials that openness, honesty, and transparency is ultimately the best p.r. I do not agree with the Pavlov-reaction of the quoted journalists. What China is dearly missing is more exposure to the rest of the world, especially when it concerns the media. That is one of the reason why I think it is important to join this kind of meetings and participate in it. Of course, it does make a difference whether you are training journalists or officials, but both need it very much. After the Nieman alumni started raising objections - but before curator Bob Giles decided to pull out of the training - I sent an email to the organizers, including Prof. Ezra Vogel, former director of Harvard's Fairbank Center for East Asian Research. I suggested that we should be more public about the planning process in order to prevent further misunderstanding. I also suggested that I should be allowed to blog the whole training event - which would probably make the Chinese officials uncomfortable, but would give them a taste of the kind of openness we are advocating. 1) none of us want to help China hide bad things going on. 2) the purpose of our seminar is to make it easier for China to respond to wishes of US journalists trying to get a fuller story of what is going on in China, 3) we believe that our program will in balance contribute to more rather than less opportunity for US journalists to get the full story in China. My understanding is that the training may still happen under some other auspices (probably not Nieman's), but the organizers will need to make the planning process more transparent and be more pro-active about making the real purpose clear. The Chinese aren't the only people with p.r. challenges. Radio Open Source, a new public radio show hosted from Cambridge, Massachusetts by Chris Lydon, devoted its second pilot show on Friday entirely to Global Voices. The show featured conversations on the phone with bloggers Hossein Derakhshan (Hoder), Ndesanjo Macha, Dina Mehta, Steve McDermott, and Global Voices co-founder Ethan Zuckerman, with me sitting in the studio. Click here and have a listen (mp3). Ethan and I were thinking maybe we ought to try and do regular Global Voices podcasts. Which brings us to another point. Right now we're working on an aggregator of written blogs... but we really ought to do aggregators of audio podcasts - and eventually, video - from around the world. If you know people who are doing interesting podcasts and videocasts from countries around the world, please hit the "comments" section and let us know!! Have you ever heard of Xinjiang?? 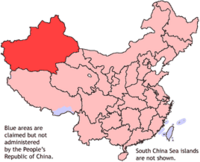 It's China's western-most province of where the indigenous people are Muslim Central Asians - ethnically and culturally more akin to people living in neighboring Kazakhstan, Kyrgyzstan, Afghanistan, and Uzbekistan than ethnic Chinese. Chinese is not their first language (most speak it with a horrible accent). Since 9/11 the Chinese government has been using the war on terror as an excuse to crack down on activists from various ethnic groups in Xinjiang - primarily the Turkic-speaking people called Uighurs - who want more autonomy, or at least more cultural and religious freedom. It's true, there are some people in Xinjiang who did in fact have Taliban links, but a lot of moderate Muslims with no links to the Taliban or terrorism whatsoever - but who just don't want the Chinese controlling all aspects of their lives - have also been targeted. Back in 2000 I traveled to Xinjiang and reported on the complicated ethnic and religious issues there. Since May 11, security agents in the northwest province of Xinjiang have tried to arrest Kadeer’s son, beaten and detained several of her family’s associates, and raided her business offices. Kadeer was arrested in August 1999 while publicly meeting with a member of a U.S. congressional staff delegation. She served five and a half years of her eight-year sentence before she was released on medical parole on March 17 and joined her husband in exile in the United States. During her imprisonment and exile, Kadeer’s five children in Xinjiang have run the Kadeer Trading Center, her million-dollar trading company in the province’s capital, Urumqi. Kadeer, who is Uighur herself, has been an advocate for the rights of this Turkic-speaking minority of some 8 million people, whose traditional homeland lies in the oil-rich Xinjiang Uighur Autonomous Region in northwest China. The Uighurs have become increasingly fearful for their cultural survival and traditional way of life in the face of an intensive internal migration drive that has witnessed the arrival of more than 1.2 million ethnic Chinese settlers over the past decade. Many Uighurs desire greater autonomy than is currently allowed. HRW has lots more on the human rights situation in Xinjiang.